This is one of the first photos I took in this automobile series. I actually lived on this street and passed this car many times until one day I saw it parked all alone. At the time of this shot I was concerned with little else but documenting the car but that green hedgerow would later become an important part of an overall composition element in all of my photographs. 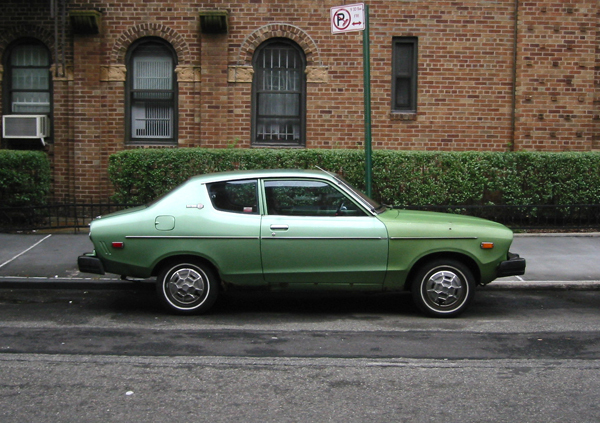 This little car is a Datsun B210, known in Japan as the Nissan Sunny. Fitting since it was shot in Sunnyside. There’s a word in Japanese that I think applies to this car, kawaii, which means “cute” or “adorable” among other things. Look at those at honeycomb hubcaps!